I am using stackapplet v1.4 it's not getting started automatically.Every time i want to start it manually from Application>>Accessories>>StackApplet.I am sure i have enabled the option Start StackApplet during login but it's not working.What's going wrong here? ~/.xsession-errors shows the following result. The problem is likely with the Exec line, if you used to be using an older version that had a different Exec command. Even if they are the same, try removing that file. 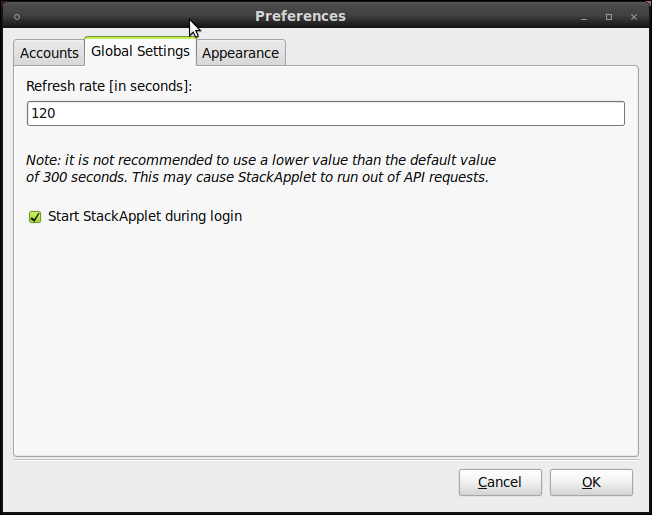 Then un-check and re-check the Start Stackapplet during login checkbox. UPDATE: Looking at your ~/.xsession-errors, StackApplet needs internet access to work. If you aren't connected to the internet right away on login, you'll need to delay StackApplet from starting before you have connected to the internet. Now open System -> Preferences -> Startup Applications, edit the StackApplet entry and change the Command: to /home/<USERNAME>/.stackapplet-start.sh. verify that it appears in the startup application: System > Preferences > Startup Applications. If it is not there , create a launcher, and add it. Not the answer you're looking for? Browse other questions tagged applet startup autostart stackapplet or ask your own question. Why won't ubuntuone service start automatically at boot? How to install Stack Applet?